What the Hell Is the Difference Between a Sweet Potato and Yam, Anyway? 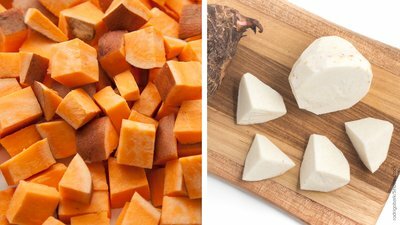 People confuse the two a lot, but there are some very interesting differences on both the inside and the outside of these two root vegetables. Colorful, oddly-shaped, bright or white flesh, these starches taste heavenly no matter how you prepare them. I’m talking about sweet potatoes. Oh, wait, are those yams? Which is which, anyway? And, nutritionally speaking, does it matter? Sweet potatoes and yams may be two of America's most misunderstood vegetables. As it turns out, they're pretty easy to tell apart from the outside. But are they the same inside? If you walk into the fresh-vegetable section of your local grocery store and see piles of pointy, potato-like things in various colors and wonder what exactly they are, you are not alone. What one store might call a sweet potato another might declare a yam, and vice versa. Do only sweet potatoes have bright red skins? If it has purple flesh, is it a yam? And is a sweet potato really a potato? It's all very confusing—unnecessarily so, as it turns out. Sweet potatoes are usually tapered, often on both ends. They come in a variety of colors and textures, with skin ranging from light yellow to golden-orange, or even red, and flesh that ranges from white, yellow, and orange, to red and even purple. Sweet potatoes are the ones we are most likely to use in recipes. If it looks more like a regular potato, it's probably a yam. 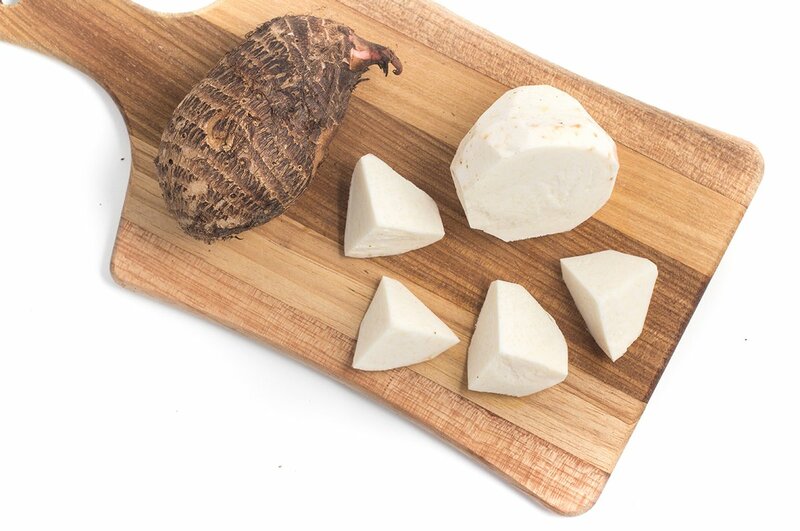 Instead of being tapered, yams tend to be more rounded. Their skins are usually darker and look more like bark. Their flesh tends to be either white or white with purple, and they can grow to be much larger than sweet potatoes. But don't worry too much about telling them apart, because yams are actually kind of hard to find in the U.S. If you really want one, try international or specialty markets. Can I Substitute Yams With Sweet Potatoes? These two root vegetables might look a little different, but does it matter which one you eat? Right off the top, one important difference is that you can eat sweet potatoes raw (if you really want to). Raw yams, on the other hand, are toxic (but perfectly fine when cooked). In terms of nutrition, these two sources of complex carbohydrates are fairly similar. Both are good sources of fiber and are relatively low on the GI scale (54 for yams and 71 for sweet potatoes), and both provide significant amounts of vitamin C, vitamin B-1, copper, and manganese. But the bright-orange flesh found in many sweet potatoes contains a lot more beta-carotene (vitamin A) than yams. In fact, a 100-gram serving (about a half-cup) provides 283 percent of your daily vitamin-A needs. The whiter flesh of yams, on the other hand, provides a meager 5 percent. What’s the difference between sweet potatoes and yams? The Kitchn. Accessed December 11, 2015. http://www.thekitchn.com/whats-the-difference-between-yams-and-sweet-potatoes-word-of-mouth-211176. Glycemic index and glycemic load for 100+ foods. Harvard Health Publications: Harvard Medical School. Accessed December 11, 2015. http://www.health.harvard.edu/healthy-eating/glycemic_index_and_glycemic_load_for_100_foods. United States Department of Agriculture Agricultural Research Service National Nutrient Database for Standard Reference Release 28. Accessed December 11, 2015. http://ndb.nal.usda.gov/ndb/foods.